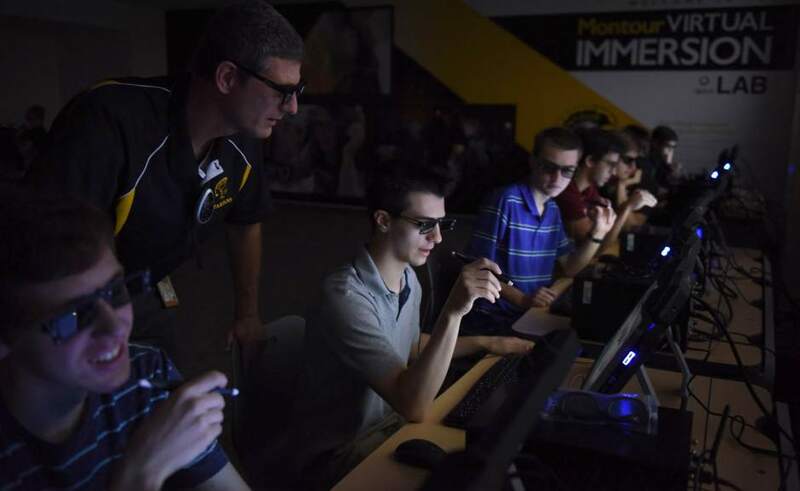 Keith Hodan | Trib Total MediaInside the Montour Virtual Immersion Lab at Montour High School, physics teacher Doug Macek watches over Anthony Catanzarite, 16, a junior, as the class practices using the new 3-D technology, Thursday, Sept. 10, 2015. Montour is the only school in Pennsylvania that has this new technology. Using special glasses, stylus, and monitor, the tech allows students to work on lessons that include the virtual dissection of everything from a red blood cell to a Tyrannosaurus Rex. “You’re able to view things you’d never see in real life,” 11th-grader Michael Maslakowski said of the elaborate software that allows users to examine a dinosaur skeleton or experiment with a car’s mechanics. The Virtual Immersion Lab at Montour High School in Robinson, which cost $70,000, is the first full lab of its kind in the state. The district spent $50,000 on the lab, and the rest was paid for with a $20,000 grant from the Allegheny Intermediate Unit, funded by local foundations, said Justin Aglio, director of innovation at Montour. “The students are amazed by it. It is unique. There’s a lot of buzz about the lab, even at other schools,” Aglio said. Nearly all of the students who have used it say the lab is “so real,” said Elizabeth Lyte, director of education at zSpace, which is based in Sunnyvale, Calif., and was founded in 2007. “You can pick up and pull out a beating heart or dissect a frog,” she said.